We always recommend enlisting the help of the pros when it comes to your wedding photos, and we’re not just saying that because we happen to do wedding photography in NJ. The truth is, while you can take the DIY approach to some aspects of your celebration, that’s not one of them. If you really want beautiful pictures, then you’re going to want that experience and skill level. However, that doesn’t mean that guest photos don’t have their place and value, because they absolutely do and unless you’re planning an unplugged wedding, then the best bet is to create a hashtag so that all the guests’ pictures will end up in the same place. That is, if you can get them to actually use that hashtag, which is what today’s post is all about. Don’t wait until the big day to start showing it off. First of all, there’s no reason to wait until your actual wedding to start getting the hashtag out there. That’s why it’s such a good idea to try to settle on one well before the big day. That way you can include it on your wedding website, save-the-dates and invitations, along with a few words of encouragement about using it, if you want. Including your hashtag on pre-wedding stationery and your website isn’t the only way to start showing it off early, though. You can also tag a few pictures of your own before the wedding and encourage your wedding party, close friends, and relatives to do the same to get the ball rolling, whether they’re shots from your planning period, bridal shower, rehearsal dinner, etc. The point is that some guests may not want to be the first to post a pic with your wedding hashtag, for whatever reason, and others may have a hard time remembering to. So, starting to get it out there any way you can as early as you can will go a long way toward getting them to use your hashtag once the big day arrives. Seize every opportunity to remind them. Like mentioned above, some guests just have a hard time remembering the hashtag itself, let alone remembering to actually tag any photos they take with it, which is why you should always try to remind them as many ways as you can. That is, within reason of course. After all, you don’t want your hashtag to take over your decor. But including it on your ceremony programs is always a good idea, as is creating some signs, or having them created, with the hashtag on them. From there, there’s your guestbook to consider, but those are just a few of many options. Think about it, whether it’s napkins, placecards, balloons, the cake topper, or straws in your hashtag’s shape, there are so many options. You can also physically tell guests to use it a few times on the big day and/or instruct your DJ to do the same. Take it from us, hearing it might just get a few guests to start posting/tagging some photos right then and there. 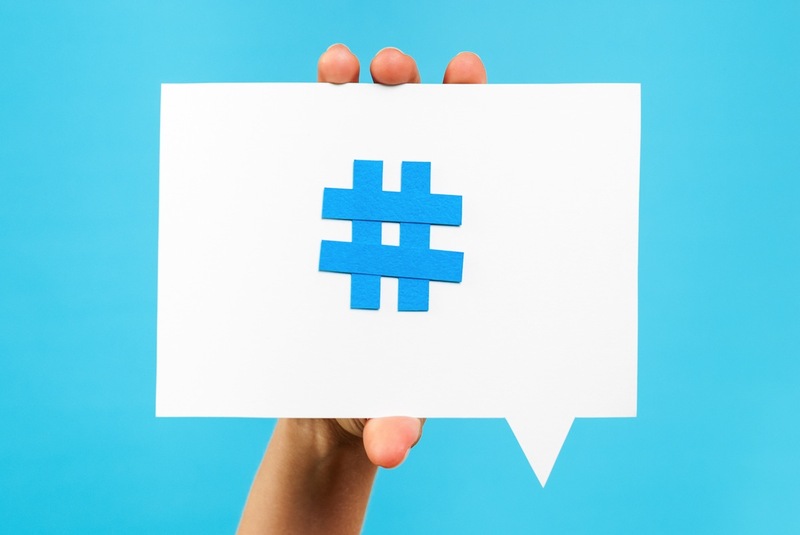 The truth is that it won’t much matter how cleverly and creatively you show your hashtag off if it’s not a truly memorable one and for some couples, creating a memorable hashtag isn’t always the easiest feat to accomplish. Some aren’t lucky enough to have unique names or nicknames to incorporate into the tag. If you’re having trouble, the best bet is to start with the basics like your names and any numbers or dates associated with your journey together. You should always look for opportunities to be clever in terms of word play too, but be careful not to create a hashtag that could potentially lead to mistakes. The bottom line is that it all starts with your creation of the hashtag itself. Only when you’ve found an unforgettable one should you even start to think of ways to show it off. But rest assured that you have plenty of options. We hope these tips get you pointed in the right direction. Good luck and for some more tips, check out this post, How to Create the Perfect Hashtag for Your Wedding, and Your Wedding Photos. About Us: Live Picture Studios has been doing wedding videography and wedding photography in NJ, NY, PA, and CT for years, and we don’t just document details, we create to inspire. Check out our photo gallery and video gallery for some examples.